We recently renewed this ad and all but one of our reviews disappeared. We previously had several reviews with a 4.9 average ratings. We have been renting since 2003 and take great pride in making our guests feel at home. Some dates may require a minimum 3 night rental depending on the season and how it fits into our calendar. If you are looking for a place to relax and enjoy the quiet, or if you just want a home base to come to while enjoying the unlimited activities of the area, you will enjoy our secluded location with no traffic. If feels like you’re in the woods in the country, but you can actually get to just about anyplace in Tulsa in less than 20 minutes. There is also a Wal-Mart Super Center 2 miles away. The Bungalow is on the lower level totally isolated from the main floor of our home in Broken Arrow, Ok. There is 1 set of stairs to the Bungalow. It is 900 sq ft, 2 bedrooms, 1 full bath, with living area, dining, and kitchen all in one large open area. 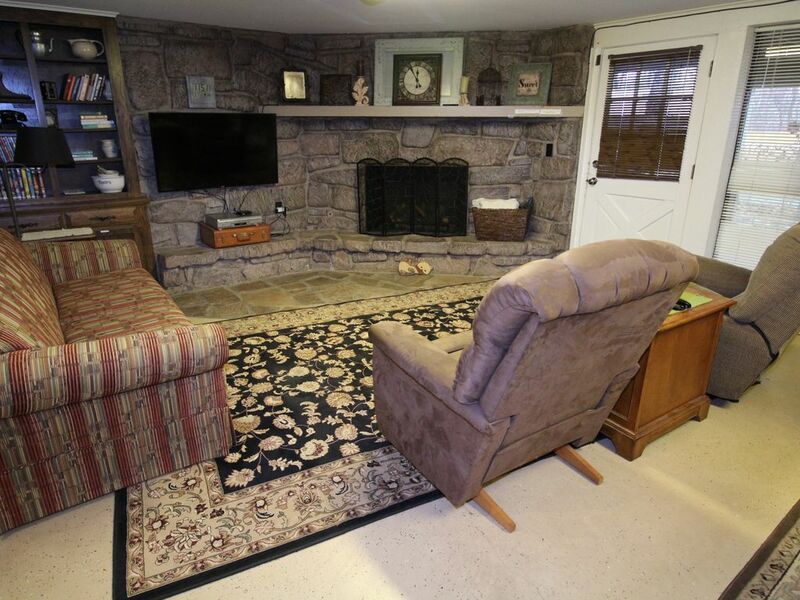 For your enjoyment & to stay cozy in the winter, there is a gas log rock covered fireplace along with central air and heat. We have a covered patio with tables & chairs where you may sit & relax & enjoy our beautiful tree-covered back yard while you cook out on the provided grill. We have grandkids, therefore our yard is very kid friendly! We have a 125 ft long Zip Line that the kids will love. We have a wooden fort with swings & slipper slide & a tire swing hanging from a huge oak tree. There’s also a large sand pile with plenty of toys to keep your kids busy. And if you like to play horse shoes, we have a horseshoe pit. If you like to bike we have a 30 mile paved bike trail ½ mile from our home. If you are in doubt just read our reviews and you will stay with us. Please no pets, no smoking inside. We also have condos in Branson Mo that we rent out so we know how to make you comfortable. There’s always something going on in Tulsa and you shouldn’t have any trouble keeping busy while you are here. Some of the activities within minutes of our home would include The new BOK Arena and Convention Center, Bass Pro Shop, Rhema Bible College, ORU, JW Davis Gun Museum, Gilcrease Museum, Jenks aquarium, Tulsa zoo, miniature golf, theatres, Tulsa Performing arts center, Brady Theater, Philbrook Art Museum, Keystone Lake, Ft. Gibson Lake, and more than we have room to list. There is always something going on at the Fair Grounds. We are: 10 minutes from Rhema, 15 minutes from ORU, 15 minutes from Jenks Aquarium, 20 minutes from the Tulsa Zoo, 20 munutes from the Tulsa Fair Grounds, 20 minutes from the BOK Convention Center. The house is soo beautiful. Inside and out, we didnt have to worry about getting house hold items because it was all already there. We saw the owners a few times through out out stay and they are very lovely people, and happy to help with whatever you may need through your stay with them. If we are ever in this area again we plan to rebook at this location. Nice play to stay outside Tulsa. Comfy and just what we needed. Thank you!